Rosette top features a row of points surrounded by two tightly pleated ruffles. Made with a white inner ruffle. This rosette is also available with our Mum Center! 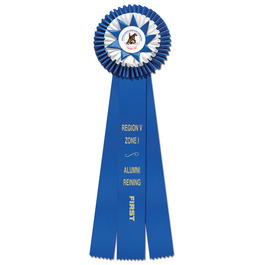 - Call 1-800-556-2440 to order this rosette with a Mum center. To view the Mum center and other center option details click here. (2) Side streamers 2" x 18"
(2) Side streamers 2" x 24"
(2) Side streamers 2" x 30"
(2) Side streamers 2" x 36"